Unlike the American Library Association members who celebrated ALA's jubilee in Philadelphia in 1926, members attending the ALA Midwinter Meeting in Philadelphia in January 2014 will be unable to visit one of America's most influential commercial museums and libraries. According to a history of the Philadelphia Commercial Museum on the website of the Independence Seaport Museum, "Opened in 1897 at 34th and South Streets, the Commercial Museum was the turn of the century United States' greatest resource for international trade information, essentially serving the role of the not-yet-existent federal International Trade Administration." The website history indicates that when the Commercial Museum finally closed on July 1, 1994, "it was a shadow of its former self". I became aware of the Philadelphia Commercial Museum after acquiring a 1919 postal card (shown above) mailed by the museum's library to the Swiss Information Office for the Purchase and Marketing of Goods in Zurich, Switzerland in which it acknowledges the receipt of a publication. 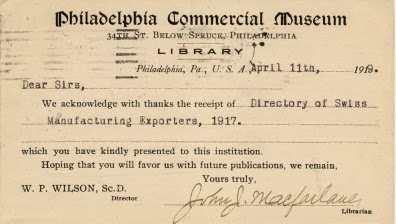 The Annual Report of the Mayor of Philadelphia for 1913 describes the museum's library as follows: "This is a public reference library comprising the principal commercial publications of all governments, and a great variety of trade literature, consular reports, books, magazines and periodicals bearing on geography and commerce. In its special line it is recognized to be the best equipped library in the United States." As the Commercial Museum scaled down and finally closed its collections were dispersed to other museums and libraries in the Philadelphia area including the Independence Seaport Museum. It is a sad thing when a once great institution is no more. Have you ever found the perfect article in one of the library databases, only to discover there’s no PDF attached? Or maybe you were looking over a reference list or bibliography and want to know how to find an article that’s cited there. In either case, we’ve got you covered! Check out this tutorial by Reference Librarian Claire Sharifi. In it you will learn how to use library tools from within our databases to find the full text of articles. Check out this tutorial by Reference Librarian Amy Gilgan. In it you will learn how to use the Journal Finder tool to find the full text of a journal you know the title of. If you still have trouble finding that coveted article, drop us a line! We’re always happy to help. Come meet some super friendly therapy dogs! Take a break from finals, and come join us! Today is the 50 anniversary of the assassination of John F. Kennedy, and like many people I know exactly where I was when I heard the news. I was a part-time employee of the Metropolitan Library of Nashville and Davidson County (TN), and I was operating the library's telephone switchboard. I was a junior in college and had just turned 20 years old. 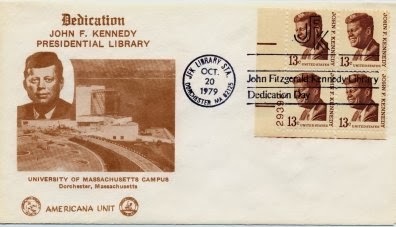 I collect postal and other memorabilia related to the presidential libraries and have a number of items for Kennedy and the John F. Kennedy Presidential Library & Museum in Boston. 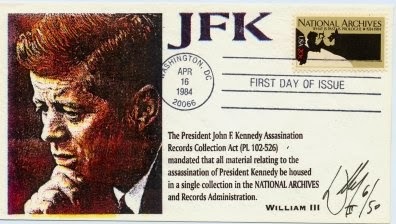 Shown above is a first day cover for the 1984 National Archives stamp which features the collection of archival material related to the assassination of Kennedy. Almost immediately after Kennedy's death planning and fundraising for his presidential library was initiated. 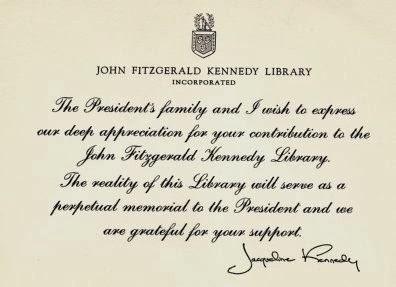 A thank you card from Jacqueline Kennedy for a donation to the library is shown below. Also shown below is a special event cover (envelope) for the dedication of the library. In a previous post about the 50th anniversary of the inauguration of Kennedy I included an image of a first day cover for the 1964 Kennedy commemorative stamp.